Q: Sometimes I wonder, I have so many unending desires and you keep on fulfilling them. This makes me smile. How to get rid of hankering over desires Gurudev? 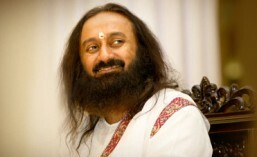 Sri Sri Ravi Shankar: You know your desires are getting fulfilled, that is enough. Be busy in fulfilling the desires of others, not your own desires. See, what is the significance of the Guru Discipline Tradition? It is for the Disciple to realize that desires are endless. When you do this then the mind becomes hollow and empty and you start feeling a sense of lightness. Life then moves beyond joy and sorrow, and all craving and aversion automatically disappear. This is the only way to remove cravings and aversions. So leave everything on the Guru, and surrender to the Guru. Fulfillment cannot be achieved through desires because if one desire is fulfilled another one comes, and if that is fulfilled another one comes. And then the mind keeps wandering between desires. Some desire or another will keep troubling your mind day and night. Do you know, if there is anything in this world that troubles you, the topmost on the list is your own mind! I am saying topmost because you do not see this. You feel that someone else is bothering you. You think your mother in law is troubling you, or your daughter-in-law is troubling you, or your wife or husband is troubling you. Keep all that as second on the list. It is your own mind which is troubling you; there is no other enemy out there. Once you realize this you will understand that it is not the other, all the botherations are of the mind. Q: In Yoga Vasistha, Lord Rama tells us that three worlds exist because of mind stuff. When the mind vanishes the worlds also vanish. What does he mean by mind stuff and how can the world exist because of the mind? Sri Sri Ravi Shankar: This cannot be explained, this can only be experienced. Till the time it becomes your experience just take the words and don’t look for an explanation. In the same way when you hear the Vedantic Truth, the more explanation you seek, the more confused you become. Vedantic words are to be heard and just allowed to sink. When it sinks in, then it comes as an experience. Similar stories are there in the Pañcatantra, you seek something that you already have. But the seeking is essential because it takes you one whole round till you get to that point where you realize Anhalhak (meaning: I am the Creator), it’s an Urdu word. The same thing has been said in Vedanta – Aham Brahmasmi (meaning: I am Brahman). So Anhalhak means Aham Brahmasmi. But unfortunately those who said, ‘Anhalhak’, were all crucified. Their heads were cut off in the Arabic world. But in India, fortunately, that was not the case. One who said, ‘Aham Brahmasmi’, they put a nice chair for him and gave him garlands. That is what happened. But these are truths that one needs to experience deep inside. Any explanation will spoil it. ← What is the need to meditate?